"Americans today are alarmed that unemployment has stayed around 9 percent for so long. But such unemployment rates have been common for years in Western European welfare states that have followed policies similar to policies being followed currently by the Obama administration (see chart above of the jobless rate in France). Those European welfare states have not only used the taxpayers' money to hand out "free" benefits to particular groups, they have mandated that employers do the same. Faced with higher labor costs, employers have hired less labor." MP: What is both really interesting and depressing (if it were to happen here) is that the annual unemployment rate in France was below 3% every year from 1970 to 1974, and then since 1984 it's been at or above 8% every year, with just a few exceptions. Not to worry, Obama's new jobs plan will be unveiled next week. I'm sure that will fix everything. His new jobs plan is to get re-elected so he has a job. I'm sure that'll cure everything. And I really don't think that clown cares what the unemployment rate is so long as long as each individual family member gets to ride on their own personal private jet at the taxpayers' expense. The irony of him going after "private jet owners"! Those people pay for their own jets while he rides around on them at the expense of people our little Ceasar clearly considers his own personal serfs. In fact, if it didn't interfere with his re-election plans. The Obamessiah would love to have a high unemployment rate so that more people are dependent on government and he can grow his personal power. the annual unemployment rate in France was below 3% every year from 1970 to 1974, and then since 1984 it's been at or above 8% every year, with just a few exceptions. The 1980's was the era of Mitterrand's socialist policies, no? As I remember it, they tanked the economy and drove out business. It was at this time that the Arnault family (Bernard Arnault heads LVMH now) left France for Florida and only returned when some of these socialist policies were scrapped. Scrapped in favour of cronie capitalism, I'm sure. But, it seems that even with some dismantling of the socialism embraced during Mitterrand's reign, the country never really recovered and continues to suffer a brain drain. A brain drain that is more and more draining not to the United States but to Singapore and Hong Kong. Hmmm, the next FDR with his own New Deal? What about Denmark or Germany? There are plenty of European countries with more robust welfare states and stronger labor movements than the U.S. that don't suffer from the employment issues that the French do. So is the scourge of temporary labor. Wherever you see it, you see an economy based on persistently high unemployment and low trust for the people that perform the actual work. I highly doubt it, since we have a Carter of Chicago. FDR was more than willing than Obama or Carter to play hardball, and present it well enough to survive repeated attempts by business interests to unseat him. If we had an FDR, they'd not have dithered in the first couple of years. They would not have been afraid of looking bad in front of anyone. They would not have been afraid to kill things like offshore labor, stripping regulations that enable things like H1-b fraud to win support. In short, you'd be outright shaking in your boots if we had someone with the vigor of FDR. He is too incompetent and un-American to be compared to FDR. Christopher, Germany has had high unemployment (over 10% in the mid-2000s). "Denmark had the world's highest tax level in 2005 and 2006, at 50.7% and 49.1% respectively." Without the war, FDR would have had an almost identical CV to our current President. He would left the job with double-digit unemployment and little, if not stagnant growth. Obama is a "normalized" FDR.
" FDR was more than willing than Obama or Carter to play hardball, and present it well enough to survive repeated attempts by business interests to unseat him." I think that pretty well sums it up. He was a thug who had great fun chasing private enterprise "..around the lot every other week," to paraphrase, of all people, John Maynard Keynes. The logic of this blog post is as follows: France has a lot of government intervention in the economy and France has chronic unemployment = all countries with a lot of government intervention in the economy have chronic unemployment. The problem with this logic is manifest. Perhaps the answers to our problems aren't simply the orthodoxies you wish and find comforting to believe. The answers are probably much more complex. Some data may not accurately represent an economy. Half of workers could earn $50,000 to produce $20,000 of real value to make income look high (e.g. in Europe). Or, for every $50,000 of additional output, there could be $40,000 of additional social costs to make output growth look high (e.g. in China). Or a country could be near full employment, while workers spend much of their time pretending to look like they're working (e.g. in Japan). France's international trade went from a surplus in 2000 to a steadily increasing trade deficits the last decade. You might be aware that the U.S. has had steadily increasing trade deficits. Hmmm. Some of the problem is shipping capital out of both countries along with fiscal defcits, welfare re-distribution of income and illegal immigration. Exactly. The economy is very complex. So complex as to not be understandable to any one or any small group of individuals. Too complex for top down government solutions. One must be able to engage in economic activity to feed oneself. That was the case in the Soviet Union as well. How? Well, there, the black market was as large as the official economy. So much for top down solutions. Employment is not, IMO, even a very good measure of the strength of the economy. How much people are able to consume is a much better measure. The standard of living in the United States is far better than any European country with robust welfare states. High unemployment is just a symptom of a bigger problem. Was there a purpose for having the shaded US recession bars on the timeline, and is there any reason that France's unemployment seems to be lowest during US recessions? At the St. Louis Fed website, the default graph option is to show shaded areas for U.S. recessions in all graphs. Sorry, I forgot to adjust that option. I figured that was probably the case. 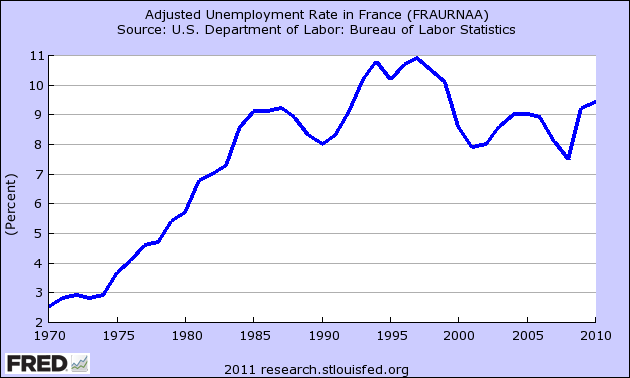 Any thoughts on why French unemployment had low points during our recessions from the 1990s until now? over the last 20 years, german unemployment has averaged around 9%. it just happens to be low right now as they crowd out the rest of the EMU due to much too low an internal exchange rate. denmark (as reported) has been a bit better, but they are mostly government jobs, and the number itself is highly suspect. it's a ridiculously small labor force. they have 2.9mm workers in the whole country and a GDP of $200bn (PPP). they would not even be a big city in the US. they have a 5.6mm population, thus a workforce participation rate of 51% which is VERY low. this makes me question their unemployment figures. the only way to claim 5% unemployment with a 51% participation rate is to define most workers out of existence. nominally, government expenditures are 176 billion out of 300bn, 58% of GDP. denmark is ab absurd little statist exemplar with very low workforce participation and astoundingly high cost of living and regulatory/tax overhead. nominal GDP is 300bn, at ppp $200 bn. i don't see anything there worth emulating nor any signs of successful employment policy.